Blackboard's Grade Center can freeze grade columns, re-order grade columns using drag-and-drop, quickly hide or display grade columns, and much more using the Column Organization page. For a complete review of Grade Center features, please go to Blackboard Help: Grade Center. Click the Manage button and select Column Organization from the menu. On the Column Organization page, look for the four headed arrows in the far left column. To drag an item, place the cursor over one of the arrows. The cursor will change to a four headed arrow. While pointing to the arrow, hold down the mouse button and drag the item to a new position in the list. Release the mouse button when the item reaches the position where it should be dropped. The grade columns will display in the new order on the main Grade Center page. Grade Center columns can be frozen in place so they do not move while scrolling through the other data. Frozen columns remain in place on the left side of the Grade Center while the rest of the columns can be scrolled across. This helps instructors easily match up individual students with their scores across the length of the Grade Center. Instructors can freeze and unfreeze any of the columns in the Grade Center page. Click Manage and select Column Organization from the menu. 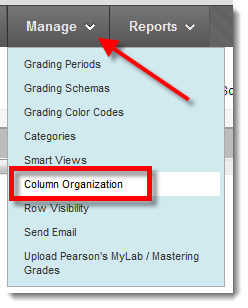 On theColumn Organization page, notice the dark gray bar. Everything above the bar is frozen. To add a grade column to the "frozen" section, click the four-sided arrow next to the item name and click-and-drag the row above the dark gray bar. In the example above, the main Grade Center page is displayed. Notice the Last Access column is frozen (gray). If a Grade Center has a lot of columns, it is sometimes easier to enter grades if some columns are temporarily hidden. Also, you may want to hide grading columns that appear in Blackboard by default that you will never use (such as Student ID or Username). Keep in mind that the instructions given below only affect the instructor's view of the Grade Center, not the student's view (My Grades). If scores are to be hidden from students, please review the Hide Scores Case Study. As a reminder, students do not see student information (such as Name, ID, Availability, Username, etc.) in their view of the Grade Center. On the Column Organization page, decide what item(s) should be hidden. Place a check mark in each check box that you would like to hide. Scroll to the top of the page and select the menu for Show/Hide. Click Hide Selected Columns from the menu. The page will immediately update. The selected column names turn gray and the word "(Hidden)" appears in the list next to the column name. On the main Grade Center page, the selected columns no longer display. Because the columns are only "hidden," they can be displayed again. To "show" items, return to the Column Organization pagee and place a check mark in each check box for each hidden item that should be displayed. Scroll to the top of the page and select the menu for Show/Hide. Click Show Selected Columns from the menu.